Front: K.E. Cline; A.W. Garrett; M.L. Greenblatt & E.A. Mercer. Rear: D.A. Miller; C.E. Cobb; W.E. Leahy; E.L. Lehr; R. Grulet; & W.H. Larmee. 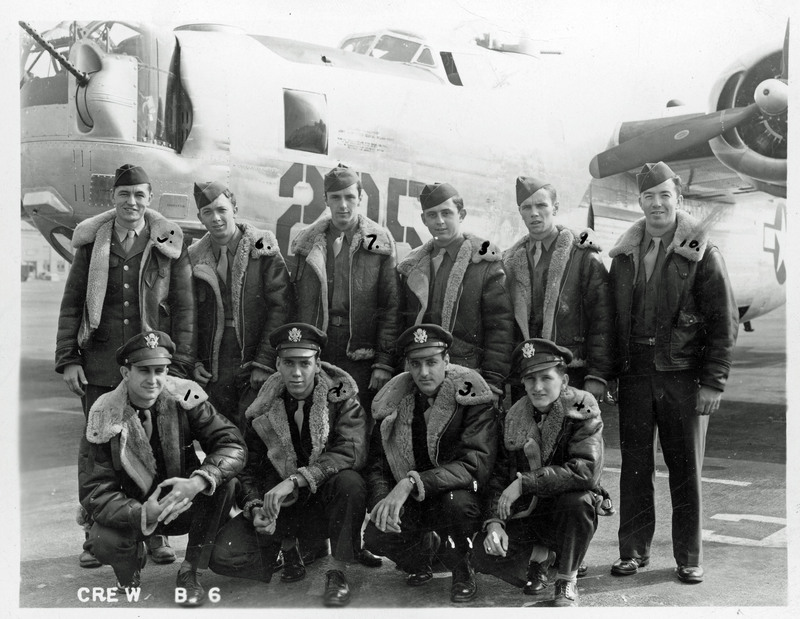 1 “Mission #283, Target: Beroun.” http://www.B24.net (http://b24.net/missions/MM041745.htm : accessed 05 April 1945). 2 “Mission 957, 17 April 1945,” Eighth Air Force Operations History (http://www.8thafhs.org/combat1945.htm : accessed 05 April 2015). 3 The loss of these 8 bombers and 17 fighters resulted in the loss of nearly 100 U.S. airmen. How many survived and were later repatriated is unknown. 4 392nd Bombardment Group (H) History, April 1945, Headquarters 392nd Bombardment Group (H), 7 May 1945, microfilm B0445, Maxwell AFB, AL: Air Force Historical Research Agency, 1973, frame 1874. 5 “17th April 1945: first time undressed for bed since last June “, War and peace and the price of cat-fish. (http://myunclefred.blogspot.com/2015/04/17th-april-1945-first-time-undressed.html : accessed 17 April 2015). This entry was posted in Uncategorized and tagged Armistead W. Garrett, Beroun, C. E. Cobb, Earl L. Lehr, J. S. Stout, Kenneth E. Cline, Milton L. Greenblatt, Rollin M. Grulet, Wayne H. Larmee, William E. Leahy. Bookmark the permalink. Such a detailed picture of the crew! The strategic bombing mission is slowly grinding to a close for the crews of the 8th Air Force B-17s and B-24s and the crews of the Lancasters and other heavy bombers of the RAF. There are fewer and fewer strategic targets. For the tactical air units, though, the war rages on as it does for the forces on the ground and at sea. The Soviets are attacking toward Berlin while U.S., British and other allied forces are attacking from the west. Buchenwald and Belsen concentration camps have been overrun by Allies, but large numbers of Allied prisoners of war (POWs) still remain in German hands. Canadian forces struggle to liberate the Netherlands. Fighting continues in Italy and in other areas still under German control. At sea, German submarine U-190 sinks the HMCS Esquimalt, a mine sweeper, near Halifax, Nova Scotia. Over half of it crew of 71 are killed. In the Far East, furious fighting continues on Okinawa which was invaded on April 1. Fighting continues in the Philippines, Netherlands East Indies, New Guinea, Burma and China. Plans are underway for the invasion of Japan. The heavy bombers crews of the USAAF and the RAF know it is likely they will be transferred to the Far East when the war in Europe ends. Another really interesting post, thank you. And a beautiful b/w photograph of the original combat crew, it’s really pin sharp and well composed. On that date I was two and a half, and we had just moved into Stanton Road in Raynes Park where we were to live for the next 16 years. It was about half a mile from Frederick French’s home. I have been struggling to post comments via my Android WordPress app but it keeps going to a screen that goes nowhere..
As mentioned in other posts in your good uncle’s story, nearly all the younger generations now do not even know they had 1,000+ bomber raids – not including fighter cover. They do not realize, likely, that in the European skies of 1942 and exacerbated by the equipment of the time, there were so many planes over target that mid-air collisions occurred. Just the time it took for all the bombers to fly over target was incredible. I recall the RAF on their own put up 1,000 plane raids. Your uncle and good family gave it their all under the unimaginable of situations, with human endurance tested beyond belief. I tip my hat to them all.